Founded in 1948, the Lower Columbia Amateur Radio Association Inc ~ W7DG ~ celebrated its 60th anniversary in 2008. W7DG can often be heard on the air operating from the club building located on 5 acres at 1000’, above the City of Longview. The LCARA ~ W7DG ~ is an ARRL Affiliated Club and has had up to 100 members. Many are active in several facets of amateur radio including community service. Due to our many volunteers and their countless hours of service, we’ve helped make a difference in our community in times of emergency, showing that amateur radio remains a valuable resource recognized by our local governments and other organizations. The club operates an array of 5 multi-mode HF stations in its club facility located northerly of Longview Washington. Frequently active on contest weekends, the clubhouse provides ample parking and comfortable facilities. 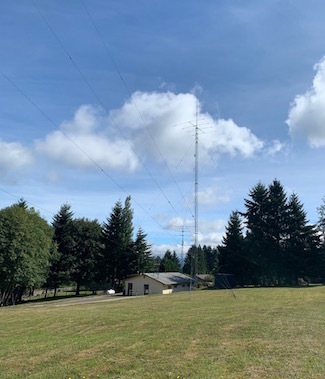 With an elevation of 1000 feet and two towers, the club site has long provided southwest Washington amateur radio operators with reliable repeater service on several VHF/UHF bands. Club repeaters are an essential part of Cowlitz County's emergency communications plan, and receive significant support from the County Department of Emergency Management. April's Business meeting normally scheduled for the third Wednesday of the month is being moved to THURSDAY, APRIL 18 to avoid a conflict with an outside event. This is a one-time change. This website is provided as a service by Lower Columbia Amateur Radio Association (LCARA).